has been sitting for close to 4 months. If you knowledgable ladies and gentlemen would be so kind as to let me know what this would be worth I would be very appreciative, KBB says 2950. Should it be more or less? Thanks in advance. Trade for a 6 pack....? miles are up there but not crazy for a honda. Do u know why the car was sitting? Preludes do hold there value well. Here in CT they are still between 4000 and 7000 for 5th gen. Thats for a 10+ year old car. They are a nice fun ride. Good gas economy if u stay out of the loud pedal! If i were u try and find one that is still stock. Then YOU can do the good stuff to it. my two cents good luck!!!! 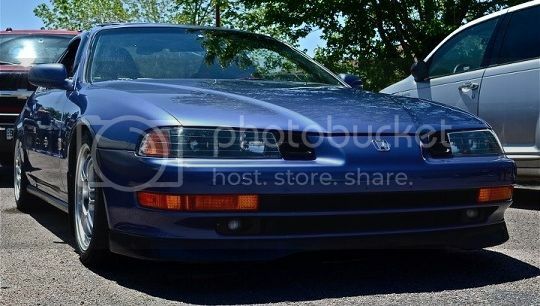 Three points to consider for a drama free,enhancement full Prelude purchase. 1: Do not by a modded car. 2: Buy a 1999 or later model because by that time most annoying problems with the car had been fixed at the factory except for the ignition switch problem, which any Honda dealer will replace for free, and you get all the stock enhancements that were added later to the car excluding a child seat tether with the purchase of a 1999 model. Keep walking. IMO painted cars have been hit 8/10 times. Torn seats, generic parts. No one who care for their car do this. Nothing about any prelude is beater. In a nutshell, service records or GTFO. thats kms not miles ? i would say buy a base and not the SH. the SH as ATTS but it wears out and it is a lot heavier. IMHO get the base and start from scratch. no mods done to it. then you can make the car your way and it will be all you. also dont get an AUTOMATIC. they are gay and take away the point of a prelude. Hondas hold their value for a long time and they can take some high miles too. mine took 263,000 miles before i considered a motor swap. ran strong too. no problems at all. sounds like a nasty headache if you decide to purchase the car. but if you're still hooked i would offer around $2000. Thanks for all the input. I am doing some checking into the car since it is not the original paint, having a buddy of mine that works for honda pulling the vin for me to see what if anything has gone wrong with the car also having a carfax pulled. I was thinking along the same line on the price that you fine folks came up with. And the mileage is actually 188,000 miles not km, which I know is nothing for a honda. the milage isnt a lot if it was taken care of. If it was maintained and the oil, trani fluid was changed and well taken care of it will be good. pull the carfax and see what it says. then tell us about that. Does the guy have a CLEAN title in hand? The car will need an oil change in 1000 miles more or less, ask when was the last time it was changed. And pull the fluid dipsticks (all of them) to see the color of the fluids, the levels or if they are dry. check to see the radio works, the speakers aren't torn, all the lights on the dash work. the little things. If you want the car after you checked out everything, and it meets your approval, I'd say 2300 is a good start for negotiating. See what the Honda records say. Hope this helps.